TACOMA, Wash. May 6th, 2017 – The Washington Employer Support of the Guard and Reserve (ESGR) Committee held its Annual Planning and Awards Meeting (APAM) at the Tacoma Dome Best Western in Tacoma May 6. Over forty volunteers gathered to receive updates, and plan better ways to engage employers and military members. During the awards portion of the APAM, there were over 100 people in attendance, representing 15 employers. Keynote speakers were Col. Jeremy Horn, Director, Joint Forces, Washington National Guard, and Navy Captain Douglas Munz, Commanding Officer of the Navy Regional Operation Support Center, Kitsap. 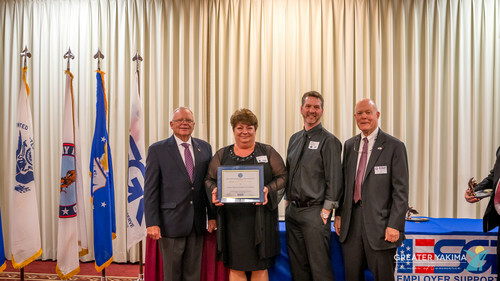 President Verlynn Best and Vice President Thane Phelan of the Greater Yakima Chamber of Commerce received an Above and Beyond Award* on behalf of the Chamber’s veteran and military programs. The Chamber Veteran and Military Affairs Committee (VMAC) meets monthly at the Chamber and organizes the Annual Veteran and Dependents Job Fair; the Chamber also provides space for the Central Washington Veterans Task Force – a group of interested individuals who meet to discuss Veterans issues and needs in our community; the Yakima Stand Down Committee; the Chamber provides membership for ESGR; and has hosted ESGR related events.